What a homecoming in heaven on Monday, September 3, 2018, as Barbara Young Purdy entered into the presence of her Lord Jesus Christ and was reunited with her heavenly mother and father, precious nephew, Sean Lawson Young, and many other loved ones. A funeral service will be held at 2 PM on Thursday, September 6, at Immanuel Friends Church, 502 S. Fieldcrest Road in Eden, with burial to follow in Danview Cemetery. There will be no formal visitation, however, family will receive friends at the home, 331 Shannon Drive. Born in Draper, NC on October 13, 1940 to the late Johnny and Charlene Young, Barbara, known to most as "Bebe", was a homemaker whose greatest joy was her rare and amazing marriage to her Godly husband of 53 years; being mother to her daughters, Anita and Melissa, and the privilege she felt being "Bebe" to McKenley, Bryce, and Bethany. 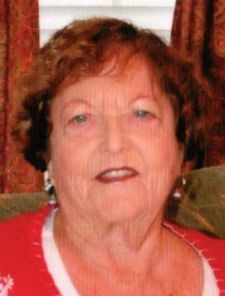 Her never-ending prayer, love, and guidance allowed for the rich blessings and many answered prayers her family received. Losing her mother when she was 16, she thanked God everyday for the blessing of watching her children and grandchildren grow up. She was ready and willing to help anyone. Her never-ending strength and selflessness allowed her to help more people and touch more lives than we will ever know. Her church and church family were so important to her and most of her happiest times were spent serving her Lord in the church. Her greatest joy was when she was in God's house. Raising her sweet little hands while praising Him, many times the congregation heard her say "I'm going up!" because His presence was so strong in her. She is survived by her husband, Wayne Purdy, of the home; two daughters, Anita Wallace and husband, Barry of Reidsville and Melissa Burroughs and husband, Tim of Stoneville; her three grandchildren, McKenley Wallace, Bryce Burroughs and wife, Libby, and Bethany Burroughs; and brother, Donald Young of Daleville, VA. In lieu of flowers, memorial contributions may be made to Immanuel Friends Church, 502 S. Fieldcrest Road, Eden, NC 27288. Dear Wayne & family, we are so sorry to hear of Barbara’s passing. She was such a wonderful and kind person. Our thoughts and prayers are with all of you during this difficult time. May God bring comfort and peace to your hearts. Goodbye to my sweet and special friend Barbara. Prayers for Wayne Anita, Melissa and all the family WcrDEfor days ahead. Love you all. Wayne, Melissa, Anita.....this is not "goodbye" it is just "until we meet again." Barbara was one special lady and you all have always meant a lot to me. My childhood would not have been complete without you all in it and Barbara was always so so good to me. The memories all came flooding in last night....the love I had being with yall at 331 Shannon Drive, the purple Gremlin Anita had, that trampoline, the beach trips, Food World, our baby dolls we played with out on the patio.....and so many more. My only regret is that I had not been in touch as much as I should have, busy life sometimes takes over, and it shouldn't. Please know that I love you all and you're in my thoughts and prayers. Anita - so sorry to hear of your mother's passing. Please know that you and your family are in my thoughts and prayers. Sorry for your loss. May all your great memories bring you comfort. Barbara was my walking buddy and encourager! So sorry for your loss ! Our prayers are with your family! Prayers for the family during this difficult time. My condolences to the family as well. May God bless your family during these days of darkness and provide peace and comfort. I mourn your loss at this difficult time. I really enjoyed taking care of this amazing lady. The relationship between this lady and her wonderful husband was the greatest love story I have ever witnessed. They will forever be in each other's heart. God bless your family.